A stunning top-flight band from Ontario performing original folk music Canadian style. Powerful vocals, dazzling instrumentals and a mesmerising stagepresence all contribute to an exciting, amusing and uplifting performance. 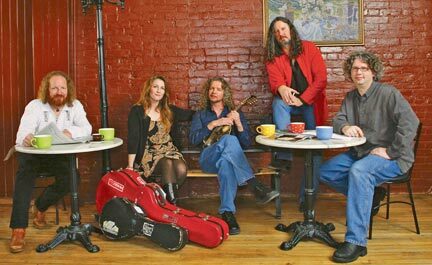 Tanglefoot first toured the UK in 1998 and have completed 11 sell-out tours since then. Unfortunately for their world-wide legion of fans, this UK tour will also be their last, as the group have announced plans to disband at the end of this year. Naturally it’s going to be a huge, rompin’ stompin’ farewell tour. Great big vocal harmonies, multiinstrumentals and stirring story-songs with a human touch. Brilliant! Get to see them while you still can!